Funds to go to implementing Economic Management and Competitiveness Credit (EMCC) program. Japan has pledged to provide JPY11 billion ($108.45 million) in ODA to Vietnam this year to help Vietnam carry out the third phase of the Economic Management and Competitiveness Credit (EMCC) program, which aims to strengthen reform in several priority fields as part of the 2016-2020 Socioeconomic Development Plan adopted by the National Assembly in April. A diplomatic note was signed by Deputy Minister of Planning and Investment Nguyen Van Trung and Ambassador of Japan to Vietnam, H.E. Hiroshi Fukada, on September 6. The Ministry of Finance (MoF) and the Japan International Cooperation Agency (JICA) also signed a protocol for implementing the ODA. 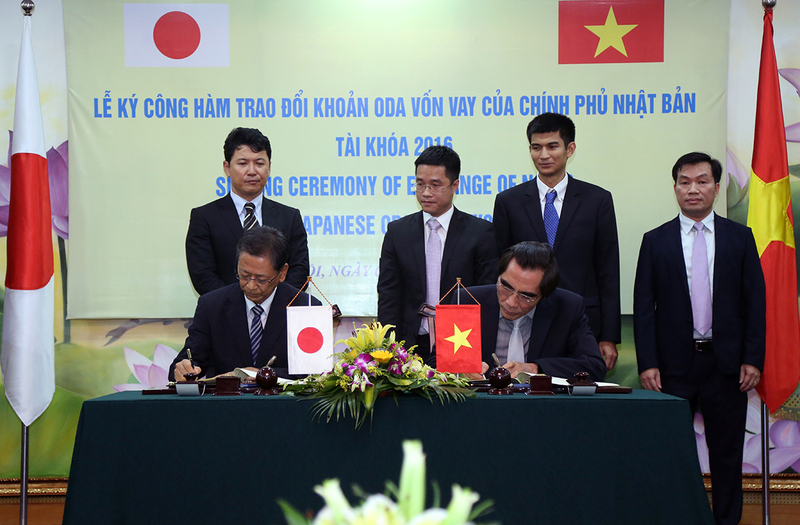 This is the third time Japan has provided financial assistance to Vietnam to implement the EMCC. The Japanese Government has continued to show its strong support for reform in Vietnam to achieve its socioeconomic targets in the 2016-2020 period, according to Mr. Trung. “The Vietnamese Government commits to using the Japanese ODA to boost transparency and effectiveness in the reform of the country’s administrative apparatus,” he added. Ambassador Fukada expressed his hope at the signing ceremony that the Vietnamese Government will use the loan productively and transparently, contributing to helping the country with its administrative and financial institution reform. Commenting on the relationship between the two countries, Ambassador of Vietnam to Japan, H.E. Nguyen Quoc Cuong, told VET that the relationship is now at its best point ever with all economic factors increasing strongly. "Both countries have shared common ground in international and regional issues. This has been the platform for Vietnam and Japan to bolster the strength of the relationship over recent years,” he said. Japan is currently the second-largest foreign investor in Vietnam, with investment of $40 billion in nearly 3,000 projects in different fields. It is also Vietnam’s fourth-largest trading partner, with total turnover at around $30 billion a year. Including this JPY11 billion ($108.45 million) commitment, Japan has provided some JPY2.8 trillion ($27.6 billion) in ODA to Vietnam.